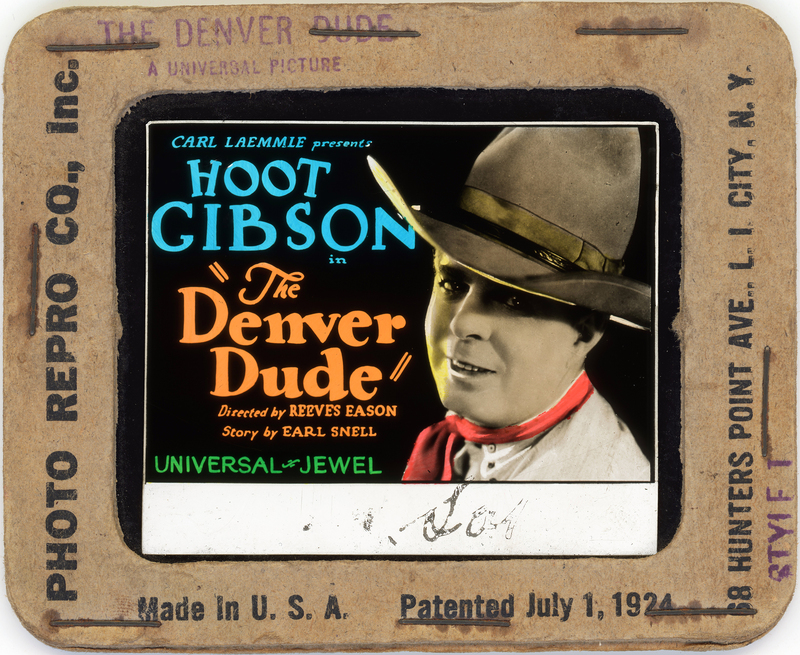 SCVHistory.com LW3297 | Film-Arts | Hoot Gibson is 'The Denver Dude' (Universal 1927). Hoot Gibson is "The Denver Dude"
Directly on the heels of 1927's "The Silent Rider" (January 2) came the second of two back-to-back pairings of Hoot Gibson and Blanche Mehaffey in Universal Pictures' "The Denver Dude," released February 13, 1927. A popular rodeo star throughout his film career, Gibson was already making appearances at the annual Saugus rodeo and would purchase the local rodeo arena in 1930. On June 28 of that year he married actress Sally Eilers at his ranch home on the property. It later became the Saugus Speedway. Presented (produced) by Carl Laemmle and directed by B. Reeves Eason with cinematography by Harry Neumann, "The Denver Dude" also features Robert McKim, Slim Summerville, Glenn Tryon, Howard Truesdale, Mathilde Brundage, Rolfe Sedan, Grace Cunard, Buck Carey	and Gilbert Holmes. About Hoot Gibson: Edmund Richard Gibson earned the nickname "Hoot" when he worked as a messenger for the Owl Drug Co. He was born August 6, 1892, in Tekamah, Nebraska and appeared in more than 200 films (including short features) between 1910, when he earned $50 for his role in "The Two Brothers," and 1960, when he made an uncredited appearance in "Ocean's Eleven." Gibson did most of his work as a silent cowboy actor between World War I and the early 1930s. He directed a bit in 1920-21 and produced some of his own films from 1923-30. The 5'9" Hollywood giant died of cancer on August 23, 1962, in Woodland Hills — five days before a wildfire burned down Gene Autry's Melody Ranch in Placerita Canyon, where Gibson made some of his movies. LW3297: 9600 dpi jpeg from original lantern slide purchased 2018 by Leon Worden.